The election process will begin in October and will end November 30 of each year. Any Active member in good standing may nominate any other Active member in good standing for an open position on the board. After verification and receipt of the completed nominee questionnaire, the nominee will be placed on the slate of candidates. Members will log-on to a secure voting website and will be allowed to vote once for each open position. Individual votes by members will remain undisclosed and confidential. Only the final result(s) will become public knowledge. Newly elected members will be notified within seven (7) days of the close of voting and are expected to attend the pre- and post-conference spring board meetings as well as the annual fall board meeting. Phase I: The nomination and confirmation phase (October). The Secretary announces the start of the nomination and confirmation phase. The announcement will be sent via e-mail to all active members and posted on the Association's website. The Secretary sends a weekly notice to the general membership that the nomination phase is active. 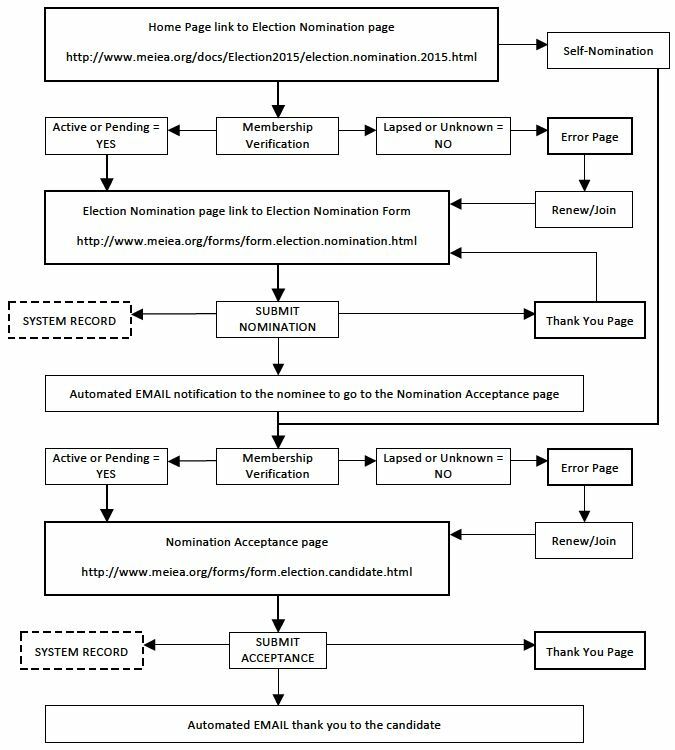 Flow diagram of the nomination and confirmation phase. The Secretary sends a notice to the general membership and posts notice on the Association's website that the voting phase is open. Included in the message is a link to the on-line voting website. Included on the voting website are links to the summary statements from each candidate. The Secretary sends a weekly notice to the general membership that the voting phase is active. Close of the voting phase (December). (1) The Secretary sends notice to the general membership that the voting phase is closed; a notice is placed on the website that the voting phase is closed; the election slate and the text of the compiled nominee statements are removed from access. (2) The Vice President verifies the results and contacts newly elected members to confirm his/her intent to serve and commitment to attend the pre- and post-conference board meetings as well as the annual fall board meetings. (3) The Vice President reports the results of the election to the Secretary. (4) The Secretary announces the election results via email notice to the general membership and the results of the election are posted on the Association website. *If the current Vice President is also a candidate in the election, an individual with no conflict-of-interest may be appointed by the Executive Board to supervise the election process.